Relevant inscriptions on this site: PAT 326 = CIS II 3980 (found in the courtyard; 34 CE); IPalmyra 24 (honors by a merchant caravan; 19 CE). Inscriptions pertaining to the official board of priests of Bel who formed a banqueting-society: IPalmyra 6, 9, 14, 15, and 434; PAT 265, 1358, 2812. 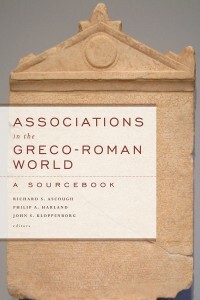 For further analysis of these inscriptions, see McLaughlin 2001, 48-61. Description: Located in the southeastern part of Palmyra, the sanctuary was dedicated to Bel, Aglibol (the moon god) and Yarhibol (the sun god). The precinct was established in 32 CE (and under construction by 24 CE), built within a main courtyard surrounded by a portico and a wall (ca. 207 x 207 m). Earlier inscriptions (as early as 44 BCE) show that a temple of Bel alone stood here before the dedication for the three deities, but this earlier temple was leveled to clear the way for the new structures (see Teixidor 1979, 1-4). The main entrance (G) to the sanctuary was from the west. To the left was a ramp used to bring in animals for sacrifice (E), some of which would have been sacrificed in structure A, which had an altar. Another structure (B) on the opposite side may have been used for rituals of some sort. There was also a banquetting hall (C). The temple itself (F) measured 55 x 30 m. The temple was surrounded by columns with Corinthian capitals. Entering from the main stairs, the inner chamber (40 x 14 m) was raised 14 m and contained two shrines (adyta), one at the north end and another at the south end. One honorary inscription from 19 CE attests to the activity of merchant caravans in thanking a benefactor for his contributions to the foundation of the temple (IPalmyra 24). In the second century at least, the board of priests of Bel formed a marzeah or banqueting-society headed by a “symposium-leader” (συμποσιάρχης; IPalmyra 6, 9, 14, 15, and 434; PAT 265, 1358, 2812). Another earlier such banqueting-society frequented this precinct too, as indicated by the dedication of an altar by the nine members of the society devoted to Aglibol and Malakbel (PAT 326; 34 CE). It is likely that other such associations and merchant groups frequented the temple and made use of its banqueting facilities. 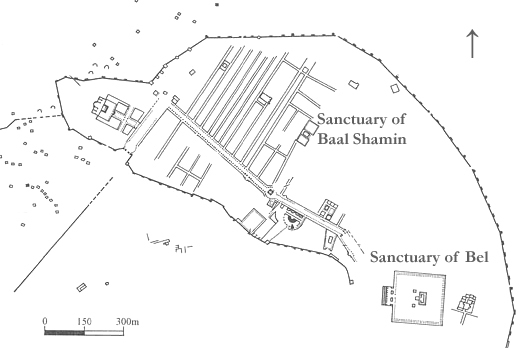 Plan of Palmyra showing the sanctuaries of Baal Shamin and Bel. 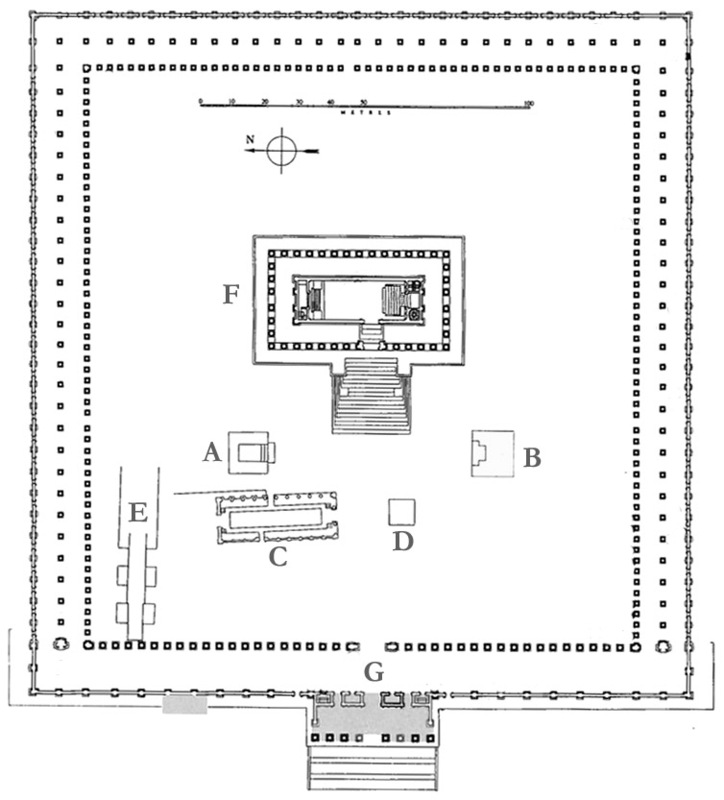 Plan of the sanctuary of Bel at Palmyra. Adapted from IPalmyra, p. 12.